Tok to Tetlin, the Taylor Highway and the Top of the World Highway to Chicken and Eagle and Boundary and Dawson City. Nonsense are the names of things around here, but there are only two roads into Alaska and this is the one to take. The Taylor Highway was built to access the rural mining communities at Chicken and Eagle, and to connect them to Tok and the rest of the world. The Top of the World Highway, once called Ridge Road, connects these and other mines to Dawson City in the Yukon Territory across the border. Both roads are spectacular. The road from the Tetlin Junction on the Alaska Highway to Chicken is roughly paved, and features some good climbing some long fast descents– it’s a great road ride. Chicken to Dawson is about a hundred miles along ridgetops and as you approach the border surface water becomes scarce, save for some melting snow. The road rolls relentlessly atop mountains and is mostly dirt, despite some failing efforts at sealing the surface. Grunt climb, fast descent to the next climb, BMW motorcycles everywhere and fuel trucks at 90 miles an hour. A motorcycle rally in Dawson flooded the roads with two-wheelers and friendly motorcycle-style waves: two fingers casually down to the left to an oncoming rider, or skyward with the left hand like a turn signal when passing (or being passed). Lael loves giving the “motorcycle wave”. Leaving the bustling Alaska Highway behind for the road to Chicken, the Taylor Highway begin by climbing from the Tenana River valley. No services for 67 miles. Perfect. Chicken is quite an attraction for summer motorists, although the real story in Chicken is gold. Mining activity is found up and down every creek, and generators can be heard humming in the bushes to operate equipment. A real life miner makes his own jewelry for sale as a way to maximize profits. Even on a bad day of mining, he’ll end with about $500 in flakes. Maybe gold mining in Chicken is in my future? At Chicken the surface turns to dirt. Hopscotching drainages, up and down, the road finally turns up toward the US-Canada border to Dawson City. Superlative, as they say– the views, the road, and the riding. Close your eyes and hold your breath when these things are comin’ down the mountain. These fuel trucks travel even faster than the motorcyclists as they drive this road every day. Just a small dot on the map, there’s not much more to Boundary than an airstrip and this cabin. Extensive mining can be seen in the valley below. New York, Washington, Florida, Maryland, Alaska. No, I don’t have family or a job in Montana. Actually, I’m going to Arizona. Oh yes, the Germans have lots of stuff. I swear it’s all here. Thirty-nine dollars American, but a couple thousand in the bank. Well, more than a couple. Last time…I entered at the Thousand Islands Bridge and exited Ontario at Sioux St. Marie. Then again at Wild Horse and Rooseville. Hmmm, I just like the Canadian countryside. Ok, bring a bank statement or ATM receipt next time? Thank you, sir. Next time I’ll be sure to bring bank statements and Ortlieb panniers full of stuff to facilitate passage. Maybe some sleeves will help too. Looking back. They say the Alaska Range is visible on a clear day. The road reaches a maximum elevation of 4127 ft, which is higher than Maclaren Pass on the Denali Highway. In fact, this is the second highest road in Alaska. And on the night before the solstice, I camped on Top of the World. This is all the darkness you get these days, which is a dream on a bike trip. I’m becoming quite attached to some of the new Revelate gear. The Gas Tank is quite handy on the bike and the “Pocket”, which I use in conjunction with a waterproof compression sack, is easily detached. For a quick trip away from the bike the shoulder strap helps keep all my essentials close at hand– Steinbeck’s Log from the Sea of Cortez, a fully-charged can of bear spray and my camera. The Surly Pugsley hybrid rolls well on dirt roads at about 20psi, although the Big Apples are a bit unsure on pea gravel. However, the smooth tire rolls like a dream on pavement. I’m hoping to procure a Marge Lite rim to build a lighter rear wheel. Absurd wheel weights are killing me and fat-lite is the way to go. There’s no reason to be riding a forty pound bike with thirty pounds of gear. I’m not sure of the actual figures, but I can assure you the bike weighs more than my kit. I’ve sent home three pounds of cold-weather clothing and rain gear from Dawson and I’m tuning the bike for a full summer of lightweight travel. As much as I’m enjoying Alaska, I’m looking ahead to some of the more challenging riding ahead– I’ve still got the Colorado Trail on my mind and am planning to fit 45North Husker Du tires in Montana. Is a 65mm singlewall rim such as the Marge Lite suitable for touring on rough surfaces? Nobody seems to know, but given the quality construction and the doublewall sections in the corners, I think it’s up to the task. I’ve become obsessed with tire volumes and the weights of things, specifically fatbike wheels. A 690 gram Surly Marge Lite sounds a treat to my knees. I like climbing, but I’d like it much more with the Marge Lite. The bike, the gear, the wheels, the packing, and the food–it’s all getting sorted out after a few weeks on the road. The legs are coming along too, although not where they were last November. My kitchen on the road and the Alaskan pantry: raisins, peanuts, oat meal, coffee, lentils, pasta, peanut butter, honey, salt, pepper, garlic and curry powder. Add fruits and vegetables when available, and cheeseburgers and ice cream in town. The plastic water bottle is filled with alcohol to fuel the “Penny Stove”. Fabricated out of beer cans, stainless steel bicycle spokes and aluminum ducting, I’ve been using this design for almost three years. I’ve built a handful for others, but have only required two for my travels. The first one was made from the Heineken keg-shaped cans, which are no longer available. The current stove was made in Steamboat Springs, CO last fall on the Divide. Trailside, it was made with a small Swiss-army knife. The blue enameled steel camping mug has been with me since the summer of 2009, and is a personal luxury. I’ve also begun to fill the 64 oz. Klean Kanteen when surface water is less plentiful or spoiled by mining activities. Cradled in the Salsa Anything Cage it is held securely even on the most rattling washboarded descents. Just be sure to tighten those straps! A final push to Dawson on the third day is rewarded with a long descent to the Yukon River and cold beer in town. The river is crossed by the free George Black ferry and Yukon Gold brew from Whitehorse flows like water in this real-life frontier town. This is also the start of the Dempster Highway up to Inuvik. Some other time. Schwalbe Big Apple 26×2.35″ on a Surly Marge Lite, a 65mm singlewall rim with cutouts at a featherweight 690g. You might have noticed I’m riding a snow bike with smooth tires and drop bars. The purple Surly Pugsley that got me through a snowy Anchorage winter is now a road bike with really big tires, or a mountain bike with a drop bar and smooth rubber, or a really burly touring bike without, “what are those things called?”. Is it a mountain bike? Yup. A road bike? Yes. A touring bike? Definitely. These are the questions that will follow me around this summer. I’m aware that’s it’s a lot to ask of one bike, but I’m asking. The response so far has been positive. Schwalbe Big Apple 26×2.35″ on Surly Large Marge. This is a 36 hole, asymmetrical rim in the double wall DH version, weighing in at 1150g. I decided to ride the Pugsley as an experiment. It is an experiment in multi-functional bike design, but also in the bicycle lifestyle where one “bike” can transport me through a snowy winter, a season of exploration around the continent, and then through the challenges of riding bikes in rural southwestern US and Mexico, on rough tracks and trails. I’d like to ride this thing in the Sierra Madre and the Copper Canyon, or perhaps the playas and arroyos of Baja. Perhaps a Baja fatbike and packrafting trip is in the cards. I want only one bike, but I want to travel without limitation. It’s hard to leave behind my 1985 Schwinn High Sierra, which I’ve ridden over the last two years of bike touring. It passes paved miles casually, and excels on most dirt roads. More rough terrain challenges the bike and rider, but I was riding 1.75″ tires and slightly bigger rubber could have extended the range of the bike, at the expense of the the paved experience. When I arrived in Alaska this past December, I came prepared with a secondhand Pugsley purchased in Seattle. A 1985 Specialized Stumpjumper also awaited with a pair of studded tires for icy conditions. Thus, I had two bikes: a snow bike and an ice bike. Come summer, and the touring season, I looked for a one-bike solution. The problem was, I couldn’t stand the thought of leaving the capacity for 4″ tires behind, but riding fat bike tires on the road down to the lower 48 didn’t sound like fun either. I could ride the Stumpjumper, as I had the High Sierra? Rather, I thought it would be fun to ride the Pugsley on singletrack later in the summer, in places like Colorado, Utah, and Arizona. In the Pugsley, I had found a rigid frame that would allow me to explore new places. But what about the transport phases where miles of paved roads are necessary? I enjoy riding pavement at times, and a long day in the saddle can easily land you 100 miles closer to a destination, or an interesting trailhead. Sometimes you just have to get somewhere. 1) Build 29″ wheels front and rear for an all-road tourer such as the Salsa Fargo. While 29×2.1-2.3″ tires would take me far, I would build, ship, or buy fat tire wheels later in the summer when I desire the extra suspension and floatation. I would also have to ship or source fat tires at that time. This requires the cost of a new set of wheels, which are not prohibitively expensive on the Pugsley as it uses 135mm hubs all around, unlike the more expensive 170mm hubs on other fat bikes. Wheels would need to be built or shipped later in the trip, which is complicated and a little costly, especially if the expense comes when I am not working. Below, as far as I got with 29″ wheels before the obvious complication (and cost) had me looking for other solutions. The rear wheel used a SRAM 506 hub, which is a quality loose-ball bearing hub with a taller non-drive side flange, which is optimal for dealing with the 17.5mm offset of the Pugsley as it reduces the spoke angle and tension on that side. I rode this half-fat setup for several weeks with a Schwalbe 29×2.35″ tire in the rear. 2) Ride fat tires (4″) all summer and avoid pavement. It’s not impossible to ride pavement on fat tires, but it’s not optimal for long stretches. Twenty five psi in the Surly Larry or Endomorph tires, or the 45North Husker Du tire make for a better ride on pavement than you’d expect. It’s a little heavy, but it rolls well. Still, for the cost of the tires, it’s absurd to wear them out in almost exclusively paved conditions. It was tempting to retain full fat bike capacity, but I wouldn’t have experienced days of good “road” riding, pushing twenty or thirty miles at a time to roll over a hundred miles in a day, and by the time I reached Montana, my tires would be toast. Elsewhere, fat tires would be a great excuse to stick to dirt, but 2000 highway miles stand between me and the dirt tracks of the lower 48. 3) RIde fat bike wheels all summer (wide rims, such as 65mm Surly Large Marge or Marge Lite), with a smooth 2.25-2.5″ tire for mixed road riding, including many paved miles on the AlCan Highway. Buy some fat tires later in the summer, and mount them to the existing wheels. Sounds simple, but does it ride well? 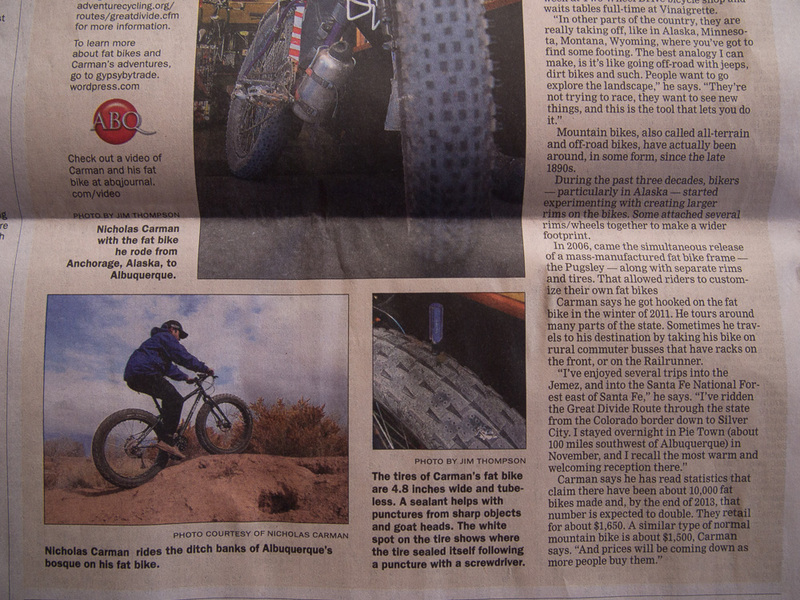 This solution was a revelation, as most discussions of retrofitting a fat bike for alternative uses focus on 29″ wheels and the available rubber, such as smooth touring tires and 2.1″ knobbies. For the Surly Pugsley, which has a higher bottom bracket than most fatbikes, the smaller tire does not lower the bike enough to create any issues in use. Actually, the BB height of a Surly LHT (26 x 2.0″ Schwalbe Big Apple) and a Surly Pugsley with 26×2.35″ Schwalbe Big Apple tires (on 65mm rims) is almost exactly the same. The Big Apple rides well on pavement and is relatively long-wearing (with a reflective sidewall! ); it features enough volume to be capable and comfortable on dirt roads, and opens up some more challenging riding as well. With these tires, I could ride every place I’ve ever toured before. 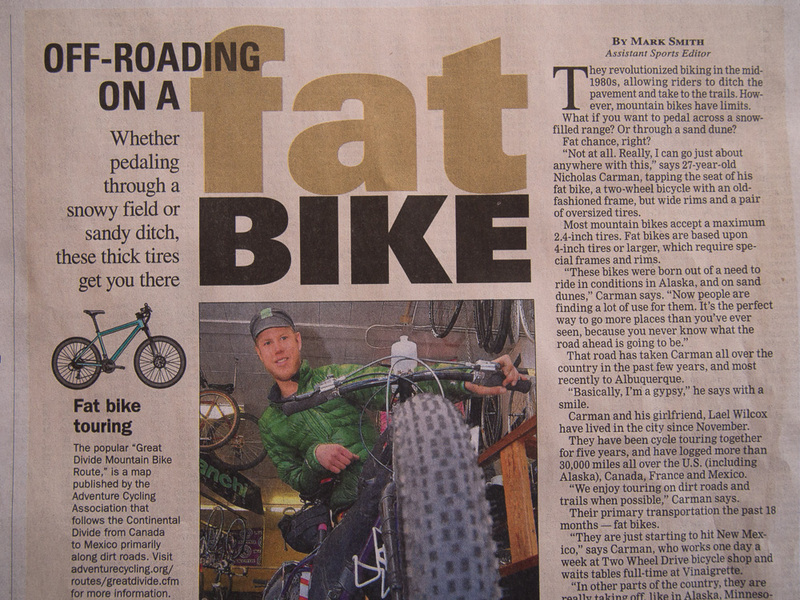 The trick: when I decide to ride some Coloradan singletrack or the beaches of Baja, I only need a pair of 4″ fat tires to be riding fully fat again. A pair of Maxxis 26 x 2.4″ Holy Rollers mounted to Surly Large Marge rims got the ball rolling on this project. I prefer the Schwalbe Big Apple for mixed terrain which includes pavement. Medium-wide singlewall rims with cutouts such as the Surly Marge Lite can lighten the bike and make “road” riding on a fatbike more tolerable. There is no harm in riding a bike with unused tire clearance– better to have it, than to wish for it. A large volume tire serves multiple functions: with higher pressures, it rolls well on smooth terrain, but with lower pressure it suspends, and floats and provides traction. An undersized tire may roll fast on smooth surfaces, but will quiver as the road turns rough. It is often stated that a narrower tire is a “faster” tire. This does not hold true when the road turns rough, where a large tire may be faster. I’d realized how versatile fatbikes could be earlier this winter. At the time, my discoveries were focused on the Salsa Mukluk which is better suited to a 29er conversion than smaller 26″ tires for summer trail riding or touring. It also readily accepts a suspension fork. See “One bike for all seasons” for my previous thoughts on riding fatbikes all year. My experience nearly plagiarizes Joe’s decision to ride his Pugsley in South America, despite a perfectly good Surly Long Haul Trucker in waiting. Discussions of function aside, fatbikes are fun and we’d both hate to travel somewhere fun without them.